What is it about dark subject matter that lends itself so well to the art of stop-motion animation? Following in the footsteps of The Nightmare Before Christmas, The Corpse Bride, and Coraline, ParaNorman arrives with another grim tale revolving around things that go bump in the night. Furthermore, it follows a trend of movies with stern anti-bullying messages wrapped around its innocuous plot details – indicating that it’s not just the living that feel put-upon or victimized. Stop-motion animation is not a revolutionary method of filmmaking but with each film I see I find it harder and harder to spot the mechanics of it. By now the technology has become advanced and the technique well-honed so much so that you may be fooled into thinking you’re watching a hand-drawn or computer animated film. Directors Butler and Fell both have a history in this medium and blend their talents remarkably well to create a world that is both familiar and new to our eyes. 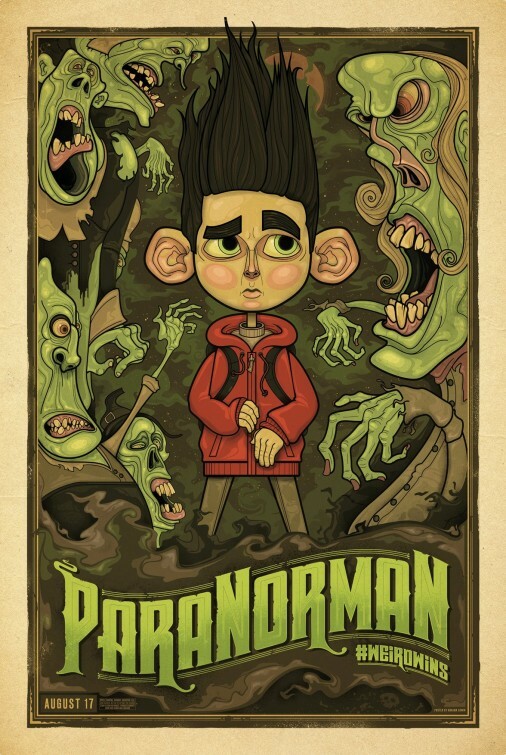 Centering on Blithe Hollow, a town that is best known for its persecution of witches (I loved their town motto “A great place to hang!”), ParaNorman follows our young misunderstood hero as he deals with a family that doesn’t get him, classmates that bully or ignore him, and his uncanny ability to see and talk to dead people. It’s a gift he doesn’t relish but still soldiers forth with – as we watch him walk to school saying good morning to various departed townies certain empathy is created for the boy with no real friends in the living world. The details of the town and townspeople are pretty remarkable in that they eschew clean lines and pretty faces for large rumps and dirty dwellings. The whole town looks like it is smack dab in the middle of a garbage dump and it’s the clear highlighting of these conditions that make the film unique. Take Norman’s mother, for instance. A friendly presence, she was still created with no chin, googly eyes, and a large pouch of fat above her abdomen. It’s a very middle-America view of the society and I thought it was a brave choice to create such ‘broke the mold’ characters in this type of film. If you’ve seen The Frighteners, think of ParaNorman as that movie skewed for a younger crowd. While its material is appropriately creepy for adult moviegoers, parents should beware its light PG rating as it really is quite scary and some material may be objectionable for children too young to be in on the joke. It’s a fairly bleak film and even getting to the resolution requires going through some tough scenes about loss that could make the car-ride home a bit awkward. With that said, I still found the film terrifically entertaining. I’m very much a kid that was into horror and scary things when I was young so this would have been a movie right up my alley when I was twelve or thirteen in much the same way The Monster Squad was. The humor hit the right chord, though I do think that some of the jokes may have aimed too high for the target age bracket. Still, if you are a big kid like me or have mature children that don’t run for cover when a scary movie comes on – take them to this and they’ll thank you for it. The film is being released in 3D and 2D so you have your choice of formats. I saw the 3D version and felt it brought me into the world of Blithe Hollow much more than the 2D could have. It’s worth the uptick in price if you go that route and its evident consideration was given to the 3D when it was being filmed. The opening and closing credits are appropriately schlocky with some clever nods to kitschy zombie films from yesteryear. The voice talent here is solid and unobtrusive. You’ll be able to pick out voices like Goodman and Stritch but others may require a little listening with your eyes closed. Don’t keep them closed too long, though, because you’ll miss some brilliant animation and a welcome departure to the usual Misunderstood Kid plot. The film may overreach a tad as it nears it conclusion. A few late in the plot twists seem to be revealed only to say “We did it first” and I think there are maybe 3-4 characters that could have been excised to keep the film with a good pace. Also, why this isn’t being released in late September is a mystery to me. It’s the perfect film to take in on a fall day as the leaves are falling from the tree s and the days of summer are becoming a distant memory.